Located on the idyllic shores of Lake Wakatipu, Queenstown has something for everyone. The beautiful resort town offers extreme activities such as bungee jumping, world class restaurants, and unparalleled lake views. 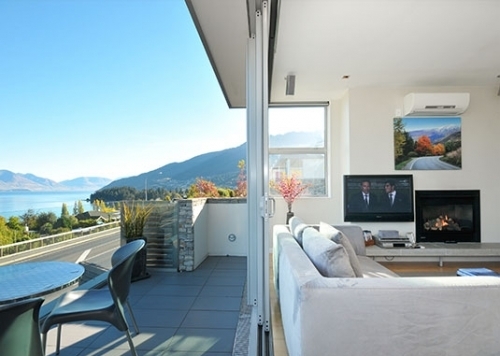 Located on the shores of Lake Wakatipu, Pounamu is a lovely place to call home during your time in Queenstown. It’s a short 10 minute walk from the center of Queenstown. 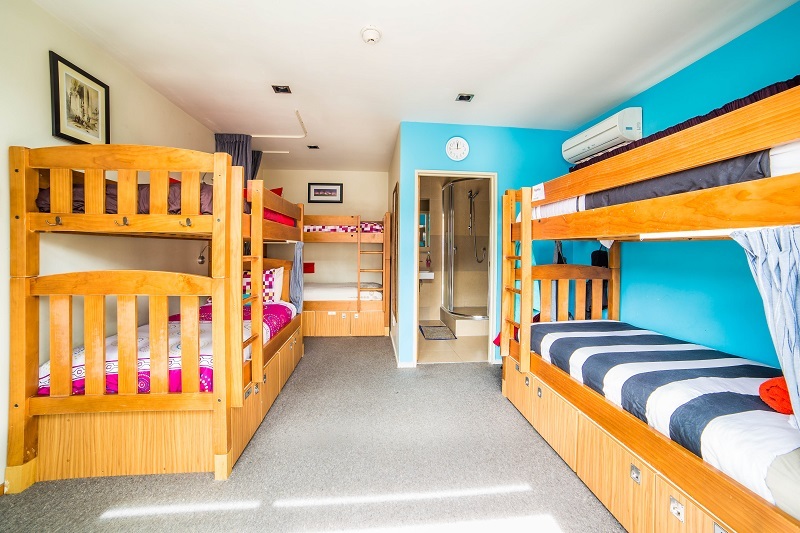 Adventure Queenstown Hostel is located in the heart of Queenstown and is walking distance to restaurants, shopping, and car rental agencies. Love coffee? Toro is your spot. This trendy tapas restaurant is a great place to stop for a flat white before bungee jumping, road tripping, or just bumming around Queenstown. If you are looking to try New Zealand lamb Pedro’s is your place. We loved it so much that we went twice! Pedro’s only sells one entrée: lamb & potatoes for two. Take away forms the majority of Pedro’s business, but there is also some dine-in seating located outside. One of the last things we expected to find in the heart of Queenstown was great street tacos. We loved Taco Medic’s fun atmosphere, delicious tacos, and great sauce selection. It’s the perfect place to stop after a long day of exploring for a quick bite. New Zealand may be known for wine, but if you’re looking for amazing craft beer stop at Atlas. Atlas is “hidden” at the end of a stretch of restaurants and boasts a vast selection of craft brews. It has a very local vibe and is great spot for a casual meal & beer. Looking to go out in Queenstown? You’ll love Vinyl Underground. This fun bar is located in a basement and boasts live music & reasonably priced drinks. This is a late night place and starts to get crowded after 11 PM. While not the most commonly-known wine destination, the Central Otago Valley is home to an amazing array of small vineyards producing some of the best wines we’ve tried. If you’re looking for an easy way to dive into the regions array of bold slow-ripened pinot noirs, among other varieties, consider one of New Zealand Wine Tours’ guided day-trips. Led by Jake, we spent the day taking in the beautiful scenery as we explored 4 vineyards specifically chosen to suit our tastes. Jake couldn’t have been nicer or more knowledgeable, and the tour even came with a paired wine-food tasting and a wine-barrel cooked meal! Strolling Along Lake Wakatipu was one of our favorite things to do in Queenstown. The lake is stunning & there really is not a “bad” view. We highly recommend venturing out to Glenorchy, a a region with stunning scenery that was featured in Lord of the Rings. Glenorchy is only a 45 minute drive by rental car, but there are also options to take buses or boats from Queenstown. One of the mistakes we made in planning our trip to New Zealand was allocating too much time to exploring downtown Queenstown. Although we loved the quaint and scenic little town, the downtown area is small and easily seen in a couple of hours. Instead of spending too long exploring the town, be sure to stop for breakfast and a walk around the lake before exploring setting of on your south Island adventure! Can you think of a better place to try bungee jumping than where is was invented? Neither can we…although we ended up chickening out. If you are looking to try bungee jumping consider a jump off the Kawarau Gorge Bridge, the world’s first commercial bungee site. Looking to rent a car and explore the surrounding countryside? Consider a day trip to north Lake Tekapo. You can make the drive in 7 hours round trip or spend the night in Tekapo, and take in the stars at the world famous Earth and Sky observatory. On the way, be sure to stop in Wanaka and drive along the west side of Lake Pukaki, a crystal clear lake with an amazing view Mt Cook, New Zealand’s tallest mountain. Although easily accessible by bus, car, or plane, Milford Sound feels like worlds away. Check out our guide on getting to Milford to help plan your perfect day trip from Queenstown. Queenstown itself is very walkable, both from central hotels and those located outside the city center. For day trips, there are several rental car companies conveniently located downtown, includingBudget, Thrifty and Hertz. Since cell phone reception can be spotty outside of town, be sure to either bring a map or choose a gps with your car rental.